This entry was posted on May 29, 2013 by seekraz. It was filed under Portraits - People and was tagged with Goshen Utah, grazing horse, horse grazing under Wasatch Uinta Mountains, photography, seekraz photography, snow covered mountains, Utah County, Utah photography. Those magnificent mountains seem to dwarf so many of our petty concerns… if we but let them. Such a stunning shot to remind us! Thank you for that. Perspective can be a wonderful thing, Gunta…and thank you…. Your landscape photos are amazingly wonderful. You’re very kind, Charlie…thank you. Thank you, Shimon…those mountains make it so easy…..
Wow! Your mountainous vistas from Utah never fail to amaze and inspire. This is a great picture and the buildings in the distance give it a real sense of scale. 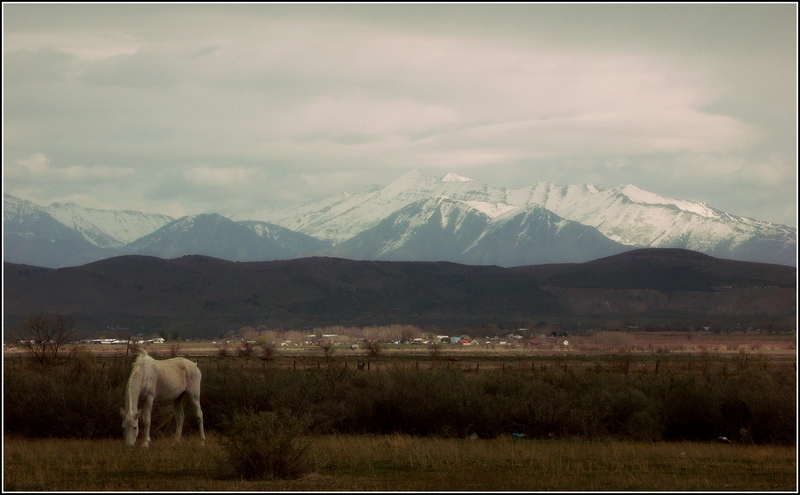 Mountains and a gorgeous equine – A marriage of majesty. I like your words, Karen….thank you. So quintessentially western – I love it. Very much so, Lynn…thank you. Ah, the horse! I love seeing him just here where I might imagine him to be. This is a classic scene. And beautiful, of course.